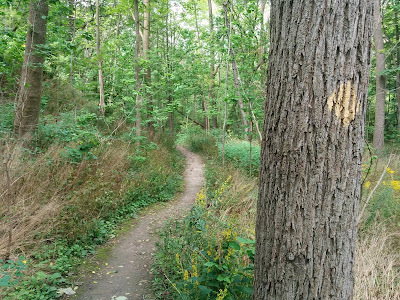 The weather took a turn toward cool, but once the clouds cleared, the sun did an admirable job of keeping things tolerable, nay, pleasurable on the Lower Spencer Creek Trail in Dundas. And for those who have abandoned all hope for more glorious fall weather, oh ye of little faith: Environment Canada is forecasting sunny skies and temps around 18C for mid week and beyond. Be prepared! Bring some rain gear and a sweater, but also sunglasses and sunscreen. It's autumn in Ontario, after all!